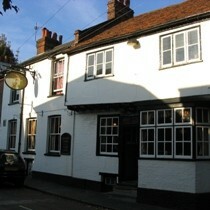 The Goat in St Albans is a popular pub visited mainly by young to middle-aged people. It has a fairly large seating area at the back. Food is served daily until 9 or 10pm. The food has apparently improved recently (April 2007) following the introduction of a new chef after a taking a downward turn. If it's back to how it used to be then the food is very good. Good selection of three or four real ales that seem to change regularly - all kept in good condition. Quiz evening on Sunday night is popular and good fun. Board games are available. Nice traditional pub (built in the 15th century) with friendly atmosphere, great place for meeting friends for a chat. Cosy area to the left of the bar with comfortable sofas. Good sized patio area to the side.